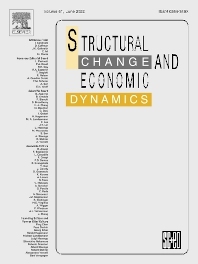 Structural Change and Economic Dynamics publishes articles about theoretical and applied, historical and methodological aspects of structural change in economic systems. The journal publishes work analyzing dynamics and structural change in economic, technological, institutional and behavioral patterns. Articles might examine the effects of the incorporation of new technologies and infrastructures, aspects of international economic integration and development, the changing configuration of employment and income distribution, interdependence between environmental and economic change, instability and crisis. An important aim is to facilitate communication among researchers who are actively engaged in the study of the various aspects of structural change and the dynamics of economic systems from an analytical or policy point of view. SCED encourages articles that apply econometric and statistical techniques to the above themes. The journal also publishes pure theoretical research on the structural dynamics of economic systems, particularly in the fields of multisectoral, complex and dynamical analysis.